Keep Soil in its Place! The Rexius EcoBlanket is rated one of the highest methods available for stopping erosion in its tracks. EcoBlanket replaces the natural layer of humus that already protects our undisturbed soils. Injected with Microblend, the EcoBlanket has increased structural integrity along with the ability to aid in the degradation of hydrocarbons that are found on many construction sites. 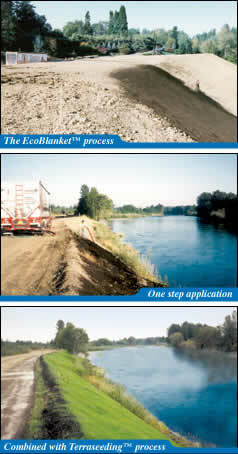 EcoBlanket is easily installed in a one step, low impact pneumatic process that can conform to about any terrain. In a Certified Erosion Control testing facility, an EcoBlanket has shown to be over 99% effective in reducing soil loss as an erosion control measure. These test results show that EcoBlanket compares with the highest rated BMPs in the industry for erosion control in similar conditions. As an erosion control measure, EcoBlanket completely covers the denuded soil with a matrix of natural organic material active with beneficial microbes. Through pneumatic application, the EcoBlanket conforms to the varied contours of the soil surface providing an interlocking blanket with the soil beneath, holding soil particulates in place. For establishment of permanent vegetation, whether it be grasses, wildflowers or native plants, the EcoBlanket can be injected with seed during the application process. The EcoBlanket material combined with Microblend makes an ideal growing media for seed while providing immediate erosion control. EcoBlanket uses no plastic materials in its construction. The fibrous matrix it forms with the help of the bonding capabilities of Microblend give the necessary structure needed without non-biodegradable reinforcements or netting. Made with recycled organics, the compost/mulch blend can be used as an earth friendly soil amendment at the completion of a project, or left as a permanent stabilizing organic layer to work into the topsoil over time. *EcoBlanket and Microblend were tested at San Diego State Universitys Soil Erosion Research Laboratory and shown to reduce soil loss by over 99% in tested erosion control conditions. An S.T.A. approved independent microbiology laboratory, BBC Laboratories of Tempe, AZ, tested and showed that Microblend greatly increased the hydrocarbon degradation capabilities of the compost/mulch materials used in EcoBlanket. Test results are available upon request.